Yamahonda Good tool "This is a great multi meter just didn’t like having no instructions"
Jake - Boston, MA, USA 5 Stars "Awesome multi-meter. Cheap, accurate, reliable, and for under $40 you can't go wrong. Tested against a friends Snap-On meter and was within .2 volts. 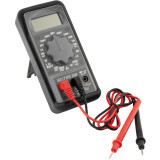 A must have tool when it comes to charging/electrical problems."